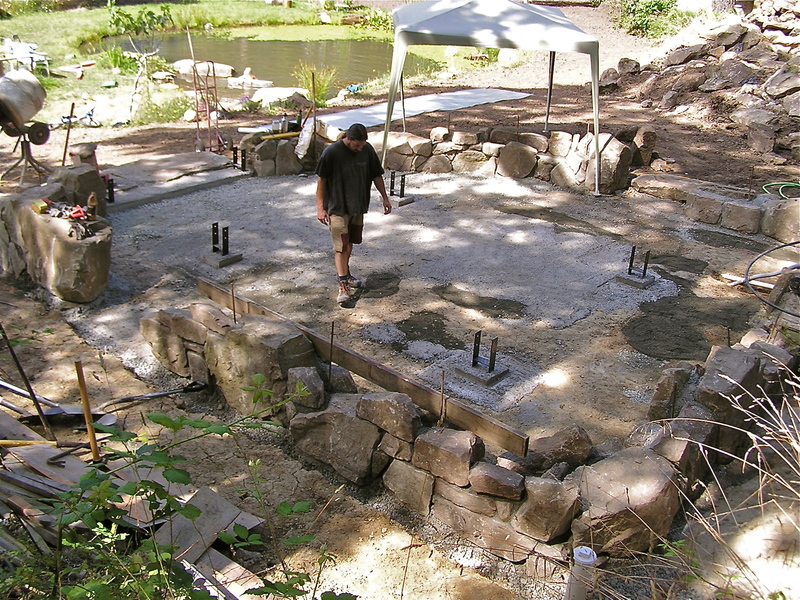 In anticipation of our upcoming cob workshops to build Colin’s woodworking shop, we have been busy setting up the foundation and floor of the building. The spot where we are building is tucked up against the bedrock slope that slants down and somewhat divides our land into upper and lower sections, the upper section being where we have just completed the first half of our strawbale house which will eventually be extended down the rock slope. The workshop is situated off to the side of this slope and as close to the side line of the property as we can go. 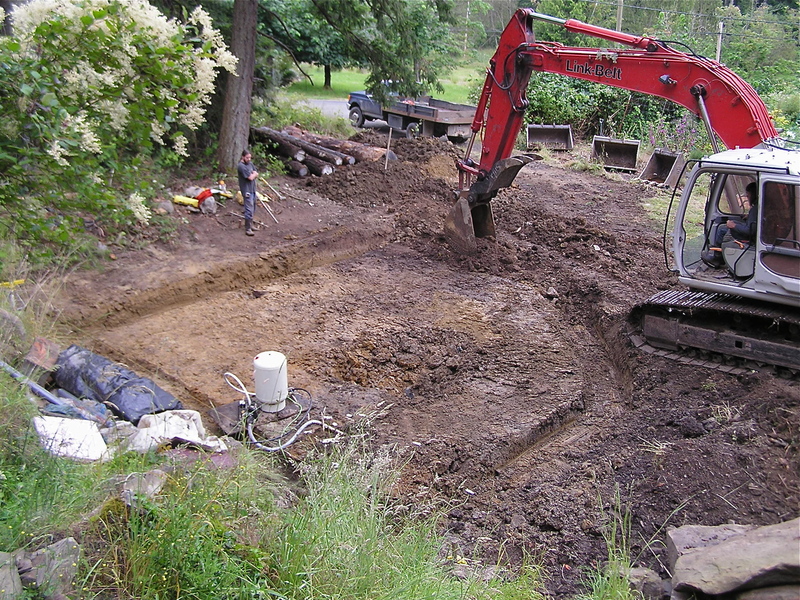 In early July we had an excavator come and dig out 2 foot wide trenches that would hold 18 inch deep concrete footing walls with drain rock along the outside. Colin built forms down the middle of the trench, using the clay walls as the forms on the inside of the trench and leaving the outer side empty for filling with drain rock. 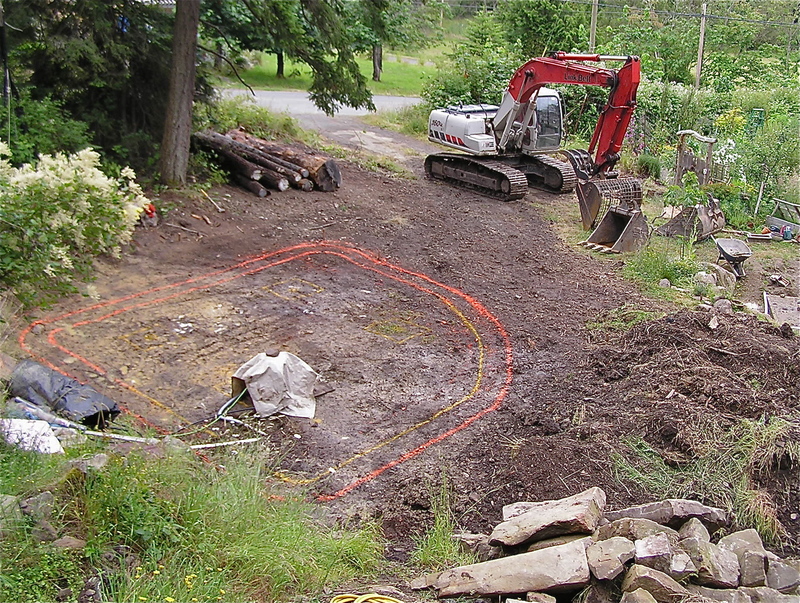 We dug a connecting trench and placed a drain pipe that went down hill towards the garden. 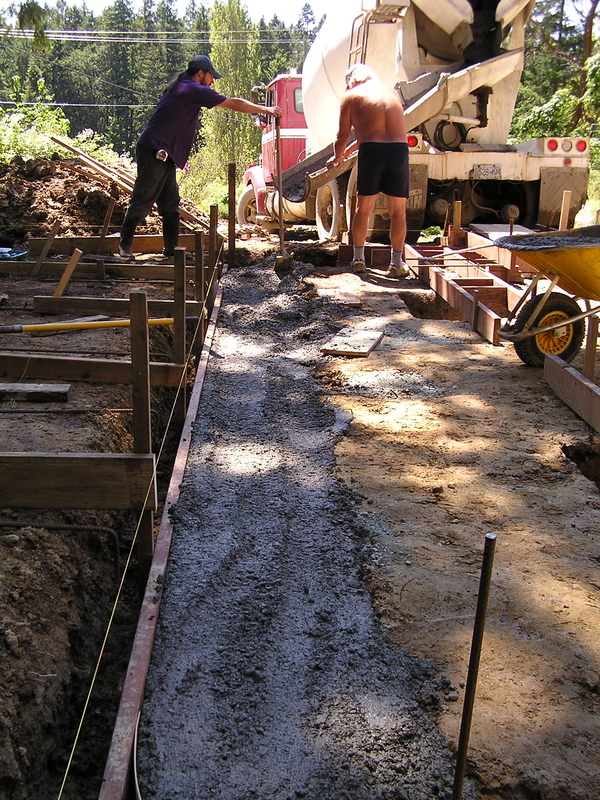 Colin added a small grid of rebar in the bottom of the trench and then called in the cement truck to pour the footings. He added stakes of rebar throughout the wall to tie together later after the stonework was done, as was requested by our engineer for seismic strengthening of the stone and concrete. 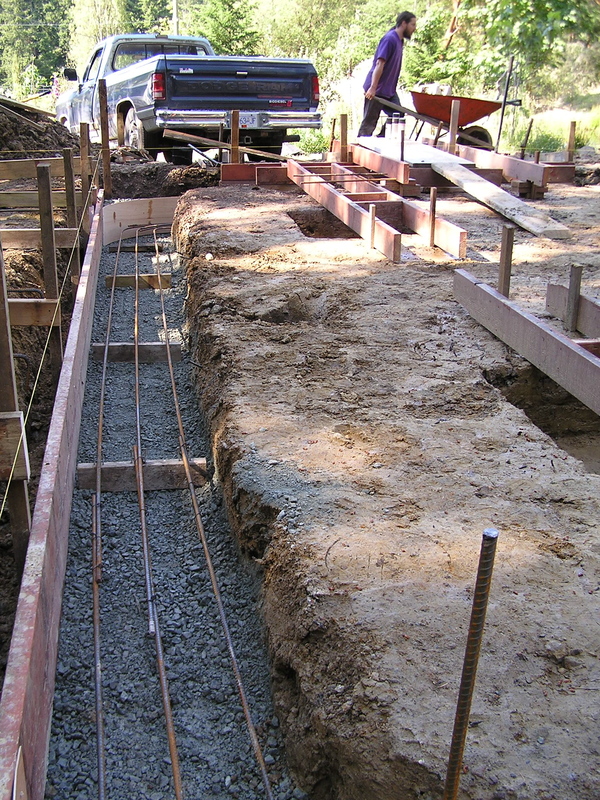 He also dug footings for t he skylight posts and placed saddles after the concrete pour. 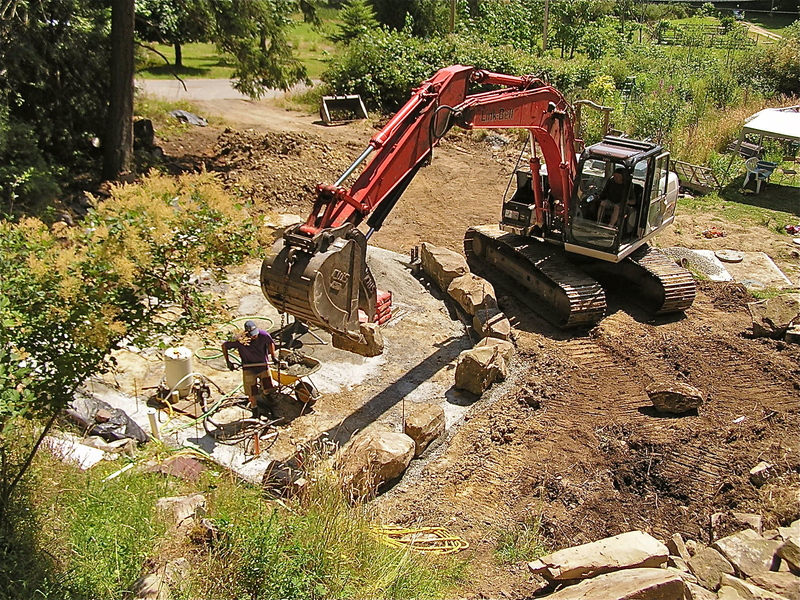 The concrete footing wall came up to the height of the clay grade, and provided a strong ledge onto which the excavator would place many of the massive stones that exist on our property. 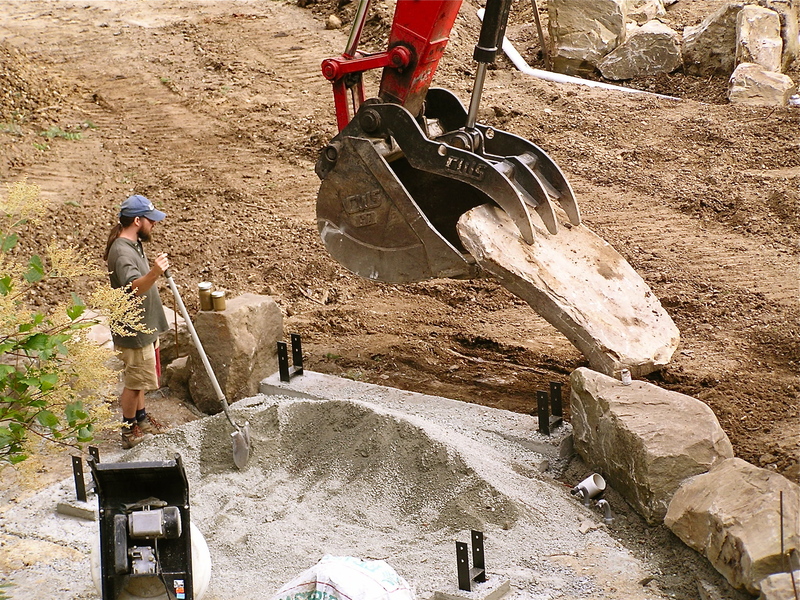 So by mid July, we had the excavator back and picking huge stones from our pile that Colin directed into the spaces between the rebar stakes, trying to place them in such a way so that he could fill in between them manually with smaller stones. 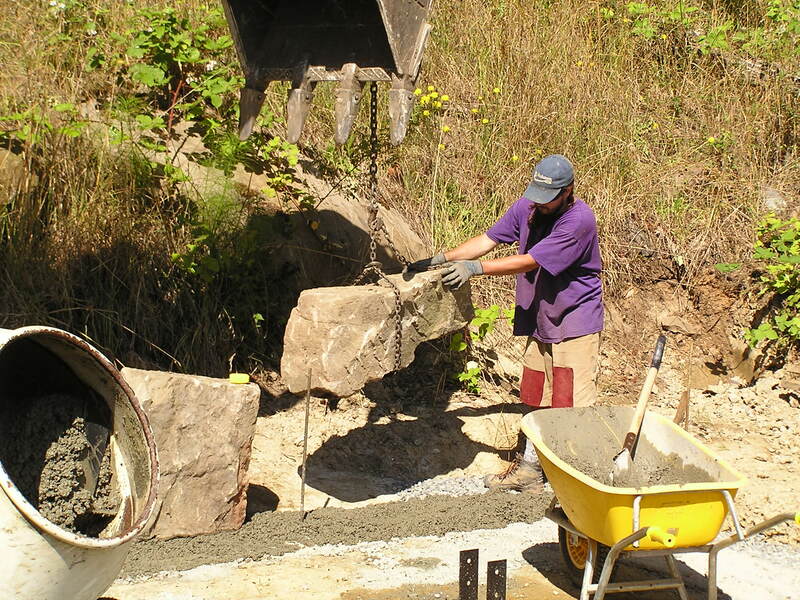 He mixed and shoveled concrete as each stone was set, and adjusted the placement so that the outside edge was either flat or sloping downwards for water run off. 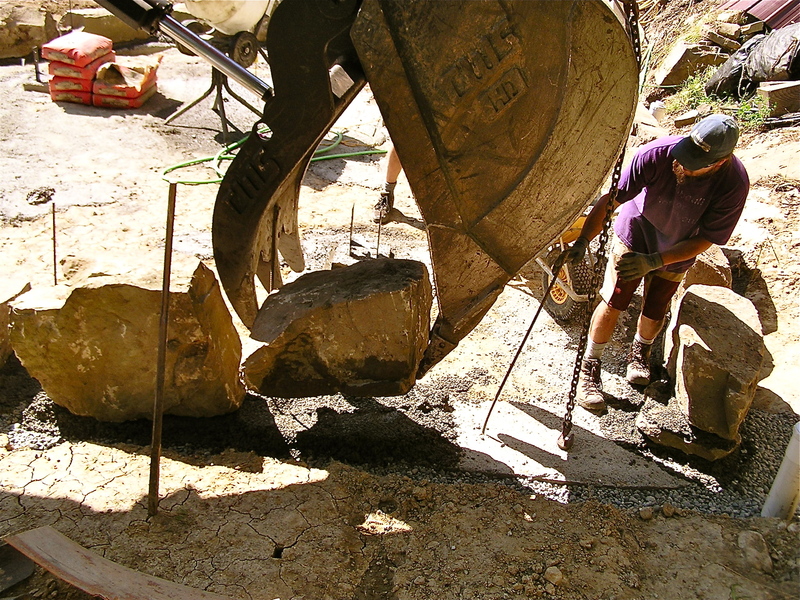 In the pile, he found two huge flat stones that were placed at the front double door entrance to the shop. 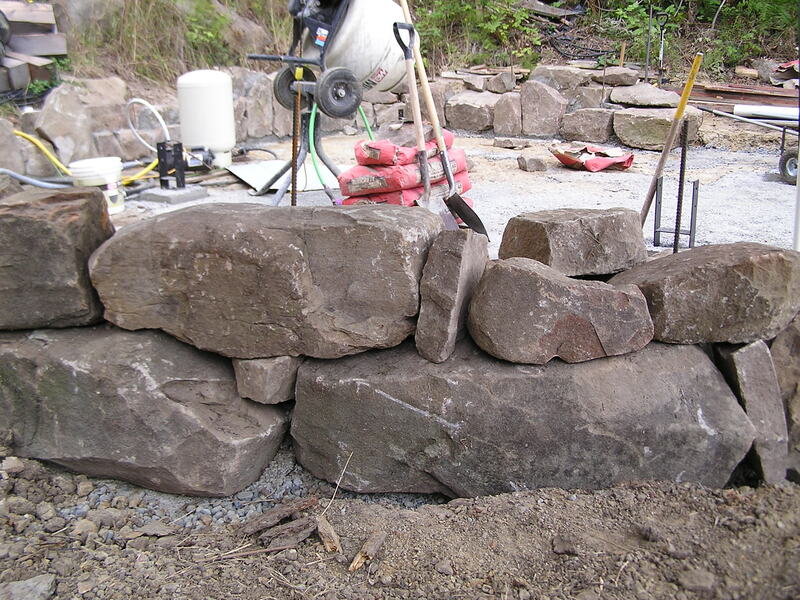 Then he spent the next few days picking smaller rocks and cementing them in the spaces, creating a two foot wide, irregularly stacked stone ledge two feet high onto which the cob wall will be stacked, keying in to the varying height of the stones for extra solidity between the cob and the stone wall. A large pile of clay left from the digging of the trenches will be used as part of the clay we need for mixing the cob, and a large pile of local pit run sand is being delivered in the next few days. Bales of straw will be picked up from the Saanich Peninsula, and a huge tarp has been strung up to protect the space from the heat of the sun as well as the unseasonal threats of rain we have been getting. The food menu for the workshop participants is being finalized, and we have even had a friend come by to film the construction of the foundation with the idea of making a small movie of the cobbing workshops and the process of building this small natural building. We are off in a few days to our annual family music camp, so getting as much done and in place now will help us feel more prepared when we arrive home and have cobbers showing up four days later! We are very excited about hosting this learning opportunity, and creating a beautiful space for Colin to work in. 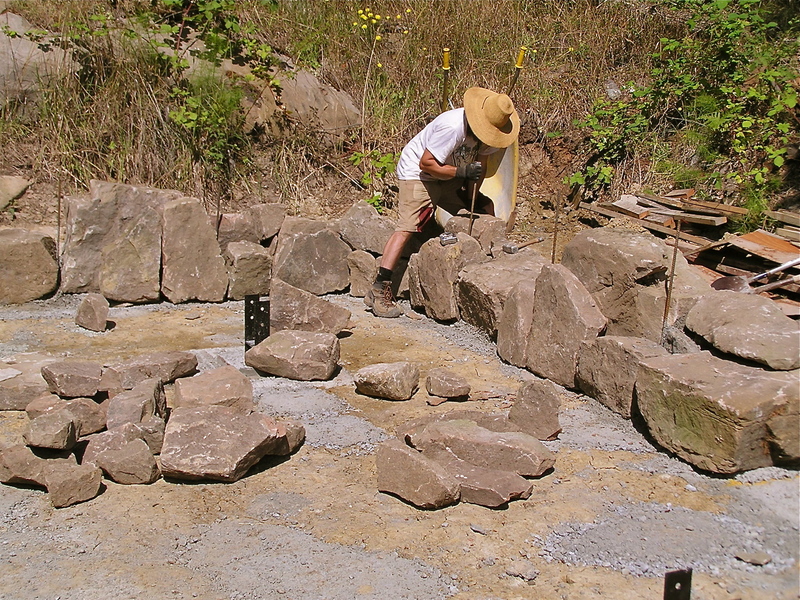 We are still accepting people to join us- see the previous post Cob Workshop Approved for details of the cobbing workshops in August. We built our house on the top section of a bedrock slope – a perfect place for anchoring the house to a solid mass. The concrete stem walls are pinned directly to the rock in a way that reaches around and flows over the various natural undulations that existed, allowing us to avoid any blasting. At the south side, where the slope falls downwards, the cavity in which we back filled with shale was about 8 feet deep, and on the north wall side, it was only 2 feet. An earth berm set back from the over hang of the roof lifts another 2 feet the length of the north wall, providing a small shawl of soil around the chilly side. We had learned from Michael Reynolds and his design features that the planet Earth is a thermally stabilizing mass that delivers temperature without wire or pipes, and we wanted intuitively to be connected to that constantly warm, grounding energy. 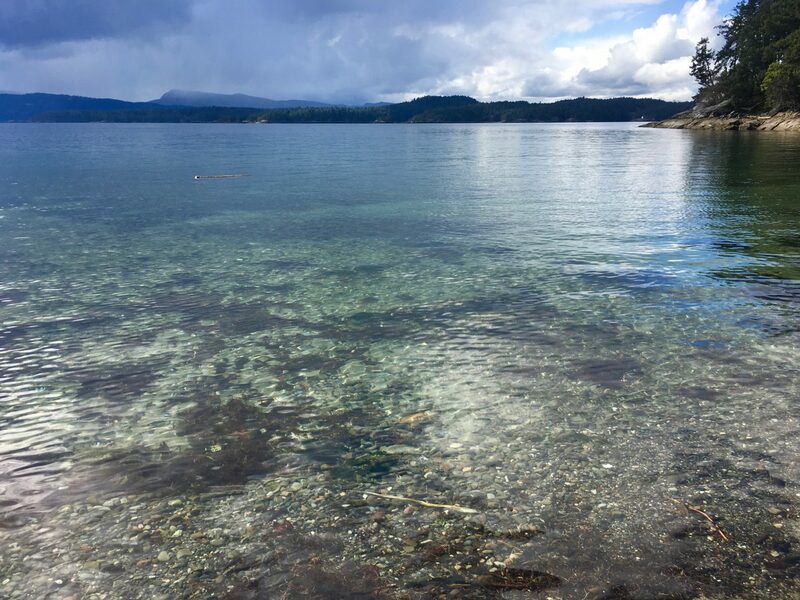 “The outer few feet of the earth heats up and cools off in response to surface weather. However, deeper in the earth, about four feet and beyond, the temperature is more constant (around 58 degrees). Here, the earth can be used to both cool and stabilize temperature if the home is appropriately designed.” earthship.com/comfort-in-any-climate. So the fill of local shale went in, packing solid down to the bedrock below. 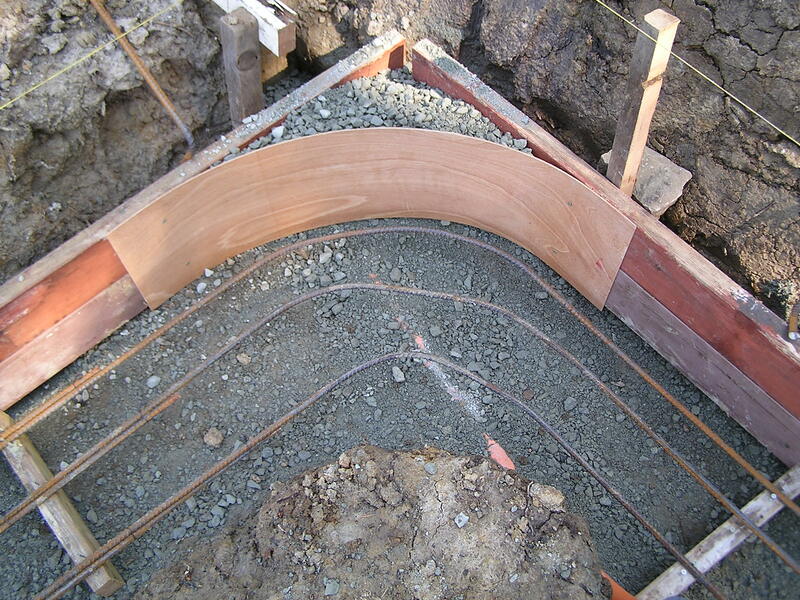 While it is not a true tapping in to the mass temperature of the earth, (instead of digging down, we filled the ground in below us) it felt better than an awkward crawl space and manufactured insulation. On top of the shale went our vapour barrier of plastic, on to which we needed (by code) a layer of insulation. Most common here is the pink foam board, but we looked around and found that mixing agriculture grade perlite with a modest amount of concrete (6 shovels perlite to 1 shovel concrete) and laying it 4 inches thick gave us the same value to code as the pink stuff. We could also neatly pack it in around all the water pipes that we put down on the plastic layer. We were able to easily anchor the hydronic in-floor heating pipes to the perlite layer before we continued up with a 3 inch thick cob slab as a sub floor. 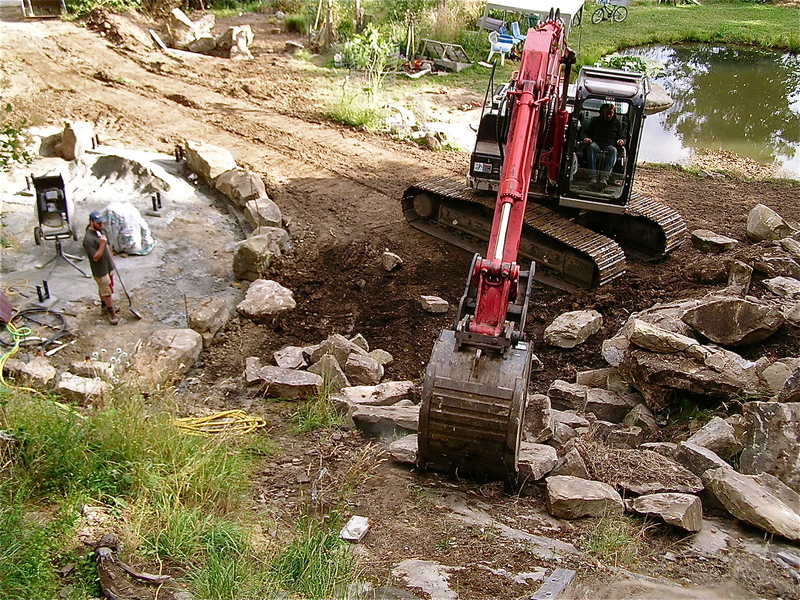 We had a bobcat mix all that up for us and we hauled it in and trowelled it in place as level as we could get it. Our original plan at that point was to finish it off with an earthen floor everywhere except in the kitchen, bathroom, mudroom and utility room, where we would tile instead. Our search for cheap tile however, was fairly unsuccessful, as was our search for a trusted earthen floor recipe and method description. Our time was being pushed as was our wallets, and at some intersections of journeys, there come times when priorities begin to change places. Our three years in the trailer was wearing us thin, and with Colin back at work to uplift our bank account, time became scarce as well. Accomplishing 800 square feet of earthen floor became daunting and expensive as we waded through the estimates of finishing oil and wax, kaolin clay and stucco sand. Then I stumbled upon a place in Vancouver that was selling ecologically certified cork flooring at a ridiculous cheap price compared to other prices we had collected, so we put in an order that would cover all but the very front south facing room. 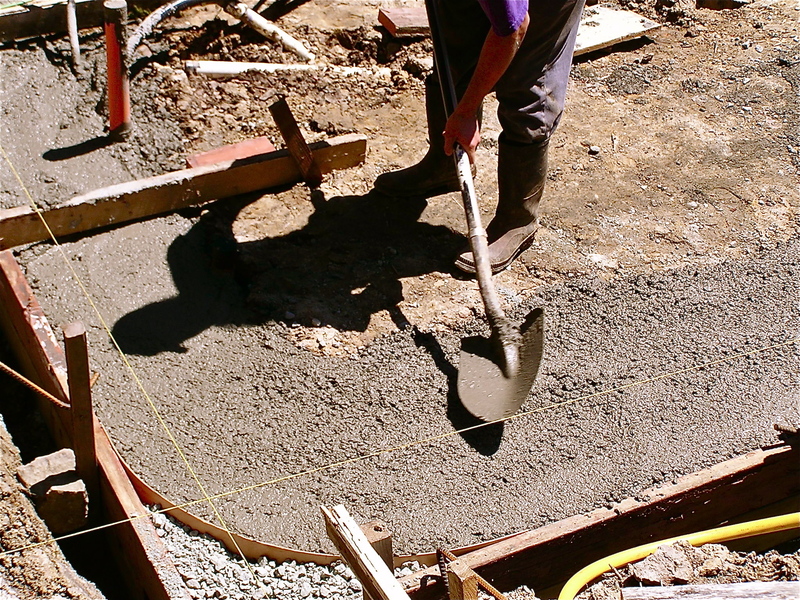 Colin was determined to make an attempt at an earthen floor in the room that receives all the passive solar sun, so as to keep the principle of mass heating intact without too much expense and time. The cork flooring was beautiful to install- an interlocking system that floats above the subfloor, allowing for expansion with the temperature fluctuations of the in-floor heating. Of course, because the cork was not as thick as we had planned for with the earthen floor, and the sub floor not at all level enough for cork tiles, we had to trowel an inch of concrete on to the whole area. The cork floor is durable and flexible, warm and soft on the feet. The earthen floor section was indeed another journey of experiment, a journey which I will write about in another post dedicated entirely to the process of the art of earthen floors. We are glad to have only done the one small section, but we are also excited about repeating the process in the second half of the house. It is wonderful to have the opportunity to test the methods that we are choosing on this half of the house, so we can learn from our experiences and navigate with more knowledge for the second half of the house.